Discovering a new talent or skill? As a special event, audiences are invited to visit with micro pigs, Dyna and Opal prior to many of the Babe performances. Dyna is micro mini pig. 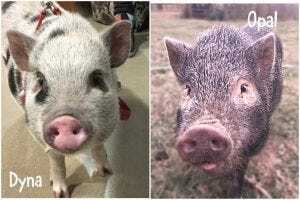 At around 30lbs., she is on the smaller side as some of these pigs grow to be 150lbs. She loves kids and attention and snuggling with her humans. Opal is an 8 month old Juliana micro pig. She knows her name, walks on a leash, and knows some basic commands (sit, come , spin). Come to the DreamWrights farm show, Babe the Sheep-Pig, which opens Friday, February 10 and runs February 10, 11, 17, 18, 24, and 25 at 6:30 pm and February 11, 12, 19, and 26 at 2:30 pm. Tickets may be purchased online or by calling 717-848-8623. Advance seats cost $10 for general, $14 for reserved. General admission seats at the door cost $12.